With the potential for much longer lifetimes and lower energy consumption as compared to current lighting technologies, the use of white light-emitting diodes (LEDs) for general lighting, an area of research known as solid state lighting, is likely to be a disruptive technology in the lighting industry in the coming years. They have the potential to be more than twice as efficient as fluorescent lighting and ten times as efficient as incandescent lighting. Also, environmental benefits such as the reduction of carbon dioxide emissions and a reduced dependence on fossil fuels for lighting can be achieved. Thus, there has recently been a great interest in the development of white-light phosphors for solid state lighting devices, specifically for use in light emitting diodes (LEDs). 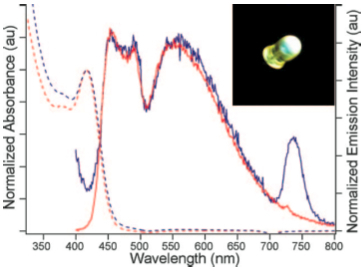 We have recently demonstrated cadmium selenide (CdSe) nanocrystals with a broad, balanced emission spectrum over the visible region due to their “magic size” diameter of 1.5 nm. When encapsulated in a perfluorocyclobutyl (BP-PFCB) polymer and coated on commercial UV LEDs, these magic-sized CdSe nanocrystals act as frequency downconverters to produce light from 420-710 nm, making them an excellent material to use as a white-light phosphor for LEDs. Thus far, we have found that the choice of encapsulant plays a significant role in the optical properties of the nanocrystal films. Some encapsulants caused a quenching of the nanocrystal emission, a modification of the white-light spectrum, and/or did not provide protection for the nanocrystals where the films became discolored and the emission intensity decreased greatly in just a few days at temperatures found in an LED junction. The BP-PFCB polymer we have focused on provides a robust and stable environment for the nanocrystals while maintaining the unique optical properties of these ultra-small CdSe nanocrystals. With the color quality of these devices in the range of those desired for general lighting, we are now focusing on increasing the efficiency of our devices by optimization of the nanocrystal concentration, UV LED wavelength, and film thickness, investigation of their scattering properties, as well as the use of dielectric thin film mirrors to increase the extraction efficiency. Absorption and emission of white-light CdSe nanocrystals, where the dashed lines are the absorbance curves and the blue lines are the emission curves. 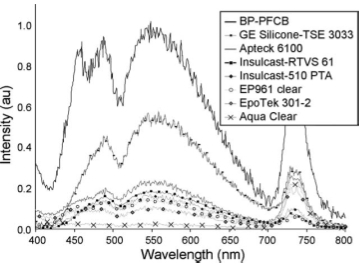 The red spectra are the nanocrystals in a toluene solution and the blue spectra are the BP-PFCB polymer encapsulating the nanocrystals in a film. The inset shows a color photograph of a UV LED coated with encapsulated nanocrystals. The emission from white-light CdSe nanocrystals in different encapsulants, with the highest intensity seen for the BP-PFCB polymer.